Classics Custom Medium Hihat 14", Hi-Hat from Meinl in the Classics Custom series. 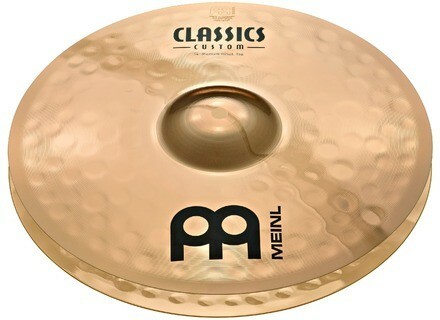 These cymbals use a B10 bronze alloy that is said to have a higher content of tin than the standard Classics Series cymbals, computerized manufacturing, and a brilliant finish. High-pitched stick definition with a strong attack. Cutting, loud chick with a heavy feel. Available in a 14" model. Fairly bright and warm stick response with a smooth crisp open hihat sound. Tight and pronounced chick sound. Balanced hats with a versatile range. Available in 14" and 15" models. Explosive, solid attack and response. Strong, full-bodied crash with excellent projection. Available in 16", 18" and 20" models. Full frequency range with a wide, full spread. Fairly smooth attack with a warm and shimmering fade. Universal crash for multipurpose application. Available in 14", 16", 17" and 18" models. Same sound attributes as the medium version, yet with increased clarity and brilliance for more cut. Perfect Rock and Heavy ride cymbal. Available in 20" and 22" models. Crisp, glassy sound with an immediate response and a short decay. Bright and cutting for fast accents. Available in 8", 10" and 12" models. Exceptional smooth attack with a great swelling sound. Brash, clear, sizzling sound with a warm undertone. Available in 16" and 18" models. The Classics Custom Matched Cymbal Set includes a 14" Medium Hihat, a 16" Medium Crash, a 20" Medium Ride and a free Professional Cymbal Case. [NAMM] Yamaha 45th Ann. Ltd Custom Heritage To celebrate the upcoming 45th anniversary of the first edition of the Recording Custom drum set, Yamaha Drums is manufacturing 45 kits built to the specifications of the most recorded drums in of all time, including 15 each of Mellow Yellow, Piano White and Hot Red. [NAMM] Sabian Holy China Cymbal Sabian introduces Holy China, the latest cymbal model added to the Sabian Vault collection. [NAMM] Sabian AAX OMNI Cymbals Not a crash, not a ride, OMNI is a new cymbal from Cymbal-maker Sabian.